Seven days ago, CEO of the most valuable, publicly-traded technology company on the planet unveiled a potentially category-changing online streaming service. In 15 more, you will be able to subscribe -- three months for free. Pundits wave the Spotify flag and spit out diatribes of disgust, much as they did when Apple launched iPhone eight years ago or iPad in 2010. Wrong again is their destiny. Will they ever learn? Many of the doomsayers forget, or maybe just ignore, the fruit-logo company's success disrupting category after category. They also start out from a misguided premise: That Apple is a latecomer who cannot catch up with competitors like Spotify. How ridiculous. iTunes debuted in January 2001, iPod nine months later, and iTunes Music Store in April 2003. By longevity and reach, which includes exclusives (like The Beatles) and large catalog, Apple is the status quo. On June 30, the giant awakes, and the smidgens shake as it walks. Then there are The Beatles, which already are digitally exclusive to iTunes. Should Apple secure streaming rights before launch, its service would stand apart from every other. Apple is credited for being an innovator, when in fact the company is a follower. Apple didn't invent the personal computer, laptop, MP3 player, software media player, app store, music store, smartphone, tablet, or smartwatch. (Did I miss anything?) Apple partly, or quite shockingly, reinvented these categories. But the company was by no means first, even though there is much revisionist history asserting otherwise (oh how fanboy tongues wag as the Apple PR machine bulldozes). Oded Shenkar says "Apple is itself a consummate imitator", in his book Copycats: How Smart Companies use Imitation to Gain a Strategic Edge. Apple has long practiced what he calls imovation -- that is imitative innovation. The approach defines many of the most successful companies. "More than anything, Apple is master of assembly imitation: it follows in the paths of many predecessors, which have existing technologies and materials to generate new technologies by recombining them", Shenkar says. In the majority of these other categories, Apple was the upstart. The newcomer. The company is the late-starter with subscription streaming -- if ignoring iTunes Match (which no one should). But unlike media players, smartphones, or tablets, Apple is the juggernaut commanding huge, extendable presence -- more than 600 million iTunes accounts, for example. Assuming that just one-six of them subscribe to Apple Music, at average $10, revenue would be a cool $1 billion a month. For some comparison, Spotify claims 75 million active users and 20 million paying subscribers. The service is available in 58 markets. 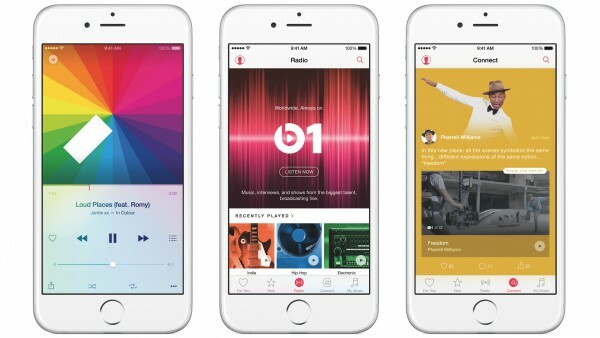 Apple Music will launch in 100 countries. Pandora asserts four million more active listeners than Spotify and reports $230.8 million revenue during first quarter 2015. One question to ask: What percentage of these 150-million-plus subscribers listen on iTunes-supported devices? How many will rush to the tidy integration Apple promises? If the typical pattern follows, as I expect, loyal Apple customers will be early adopters. They can access their vast music libraries alongside other content on devices already supporting iTunes (e.g., iPad, iPhone, iPod, Mac, or Windows PC). Three months free will tempt many other streamers to compare Apple to oranges. After which, they can pay $9.99 monthly for one subscription or family of six for another five bucks. Yeah, the best features and pricing are imitative. But that's what the great copycat does so well, by sprinkling sugar and spice. Everything is nice and fits into a larger lexicon of digital lifestyle. Critics complain about lofty Mac pricing but millions of buyers still pay the premium. Apple sold 4.5 million computers during calendar Q1 2015, generating $5.6 billion revenue. That works out to an average selling price of $1,230 -- a number most competitors would figuratively kill for. The point: The company often succeeds by acting in ways that defy the logic of others. Apple brought the original iTunes to market 14-and-a-half years ago by buying and later adapting SoundJam. It wasn't the first buyout to go Apple native, and Beats feels similar. The $3 billion acquisition was announced in May 2014. Valuable assets included cofounders Jimmy lovine and Dr. Dre. The Beats brand adds to Apple's, the music and radio services become basis for the subscription streamer, and the tech titan gains valuable inroads with artists (and even labels). There would be no Apple Music without Beats. In music production, there is concept of the hook -- the beginning riff that pulls in listeners. I see Beats 1 radio as being the hook for Apple Music. For pundits arguing that the fruit-logo company can't compete without a free tier, the new radio service -- or even the old one from iTunes -- is just that. Only better, if delivering as promised. Live programming is a huge differentiator. Some of us are alive long enough to remember when MTV actually aired music videos introduced by VJs. Ah, Martha Quinn and Mark Goodman -- and three others. There was a rawness about early-years production values that made the first five feel fresh and approachable -- like many successful radio disc jockeys. The personalities that matter aren't just the artists, but the people producing or playing their music. Beats 1's potential is huge, depending on execution. While radio is free, Apple's big benefits will come from tie-ins to subscriptions and sales. The music juggernaut sits atop a mountain of potential. In 2014, global music industry revenues from physical and digital formats were equal at 46 percent, respectively, according to IFPI. Free and paid streaming subscription service revenues grew by 39 percent. "The subscription model is leading to more payment for music by consumers, many of whom appear to be shifting from pirate services to a licensed music environment that pays artists and rights holders", the trade group finds. The number of paying subscription subscribers reached 41 million last year. That's globally. Meaning: There is plenty of room for an imitator like Apple to grow and also turn streaming, whether DJ or customer chosen, into further song sales. Despite streaming subscription service gains, paid downloads still account for more than half of digital music revenues, which plays to Apple's core even as it seeks to expand the crop. For the pundits harping that Apple Music can't compete against free tiers from the likes of Pandora or Spotify, consider the paid downloads statistic and something else: In 2003, Apple also faced fierce competition from free music -- that which people pilfered from the successors of Napster. The file-sharing site ignited a revolution that labels tried to extinguish but failed. Someone will always pay, as iTunes Music Store's success shows, and IFPI indicates that it's more people every day. From my vantage point, Apple Music Connect could be the platform for artist engagement with fans and for enabling more independent publishing. The component also encourages posting of exclusive content that fans might want and makes Apple Music more appealing than competing services. Candid shots from backstage. In-progress lyrics. A rough cut of a new video. Here, artists can share just about anything they want. Because when musicians are free to express themselves directly to their fans, it’s a powerful thing...Musicians can post songs and videos to enhance existing albums in their discography. Which gives you a chance to gain more insight into the meaning of songs, discover sources of inspiration, and get greater depth and more context about music you may have been listening to for years. Think Myspace Music during its brief dominance or what Facebook offers today -- only better presented and with tools that encourage dialog between artists and their fans. My question: Who owns the rights, when Jon Snow comments with the perfect tweak to that lyric in progress? Imagine independents publishing directly sans labels, as another opportunity. Content producers also gain from massive marketing, which Apple does all too well. Watch TV during primetime any evening and count how many Apple commercials air and compare to the low number from any other high-tech company -- other than cellular carriers. Do you think Spotify spots will outnumber Apple Music by any appreciable measure? If you closely examine Apple marketing, going back to that for the original Macintosh in 1984, making the machine more human -- more responsive to you -- is a consistent theme. Another: Aspiration. The promise: Apple products enable people to be happier, to have better lives. Whether or not that's true is topic for comments. My point is the marketing messaging, not its truthfulness; for this analysis. Music is very personal, and people want to engage other people not some algorithm. Apple promises real music programmers working behind the curtain, alongside artists via Connect, or DJs on Beats 1. When I pull all the pieces together, I see an exciting platform of opportunity that feels in potential like the iTunes Music Store did 12 years ago.